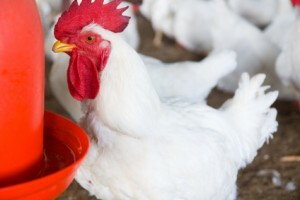 Chicken is a significant source of daily requirements of protein, niacin, B-6, B-12, vitamin D, iron and zinc. It’s lower in fat and calories than most protein sources. White meat is lower in fat and calories than dark meat, but dark meat supplies more iron – a crucial nutrient, especially for women. A male chicken is called a rooster. A female chicken is called a hen. A young chicken is called a chick. 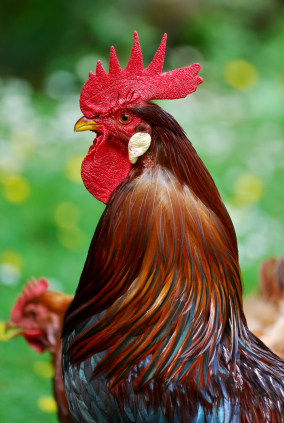 The most popular chicken breed raised for meat is the Cornish Rock Cross. Broiler & Roaster chickens provide main products such as drumsticks, wings, chicken breasts, chicken nuggets and chicken tenders. They also provide by-products that are used in making noodles, candy, hot dogs, dog food and much more. 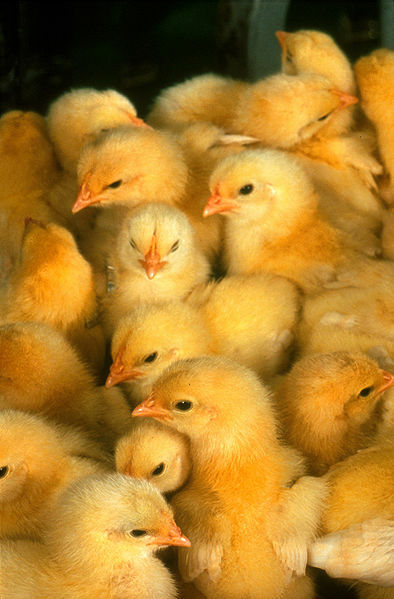 A broiler house may hold as many as 20,000 chickens. Broiler houses are cleaned and disinfected before each new flock of birds is brought in. The eggs are gathered and placed in an incubator, where the temperature and humidity can be precisely controlled. Twenty-one days after beginning incubation, the eggs hatch. The chicks are moved to the broiler house, large buildings where the chicks will be housed until they are ready to market. The broiler house protects the birds from bad weather and predators. In the broiler house, the chicks must be kept warm. They huddle under brooders where the temperature is kept around 90 to 95 degrees. As they grow and develop feathers, they no longer need the brooders for warmth. The chicks are provided with plenty of fresh water, and feed that contains all the protein, vitamins, and minerals they need for growth. In six weeks, the broilers weigh on average 5 to 5 1/2 pounds, the biggest weighing up to 8 pounds, and are ready for processing. Roasters are fed up to 10 to 12 weeks, weighing 8 to 9 pounds when ready for processing. Chicken can be purchased from the market as whole fryers or already cut into pieces ready for cooking. We can also buy cooked, ready-to-eat chicken at many restaurants. Turkey has lower calories and more protein than beef or pork. It provides the opportunity for quick meal preparation, and blends well with other meat for a delicious taste. A male turkey is called a tom. 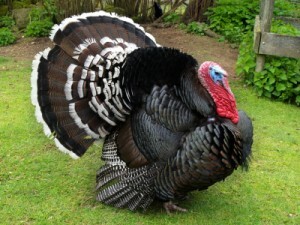 A female turkey is called a hen. Turkeys are raised in scientifically designed and environmentally controlled barns that provide maximum protection from predators, disease and bad weather. 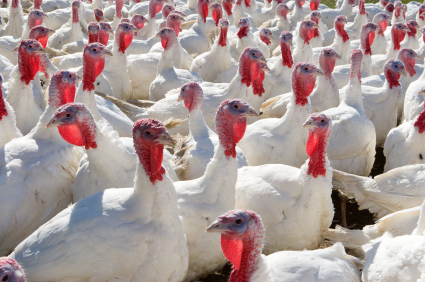 Turkey companies are vertically integrated, meaning they control or contract for all phases of production and processing – from breeding through delivery to retail. By maintaining control over research, hatching, growing, feeding, processing, packaging, transportation and marketing, the industry is able to produce wholesome, safe, high-quality products at the lowest possible cost to the consumer. Brooder Houses house poults for 6 to 8 weeks, where they have feed and water at all times. Grower Houses are where toms and hens are fed until they go to market. Toms are ready for market at 18 to 22 weeks of age and weigh 30-38 pounds. Hens are ready for market at 13 to 14 weeks of age and weigh 13-14 pounds. Both are fed grains such as corn and soybeans. On average, it takes 75 to 80 pounds of feed to raise a 30-pound tom turkey. Hens are processed and usually sold as whole birds, drumsticks, and turkey breasts, while toms are further processed into products such as cutlets, tenderloins, turkey sausage, bacon, franks and deli meats.